Again sharing another small nature scene. 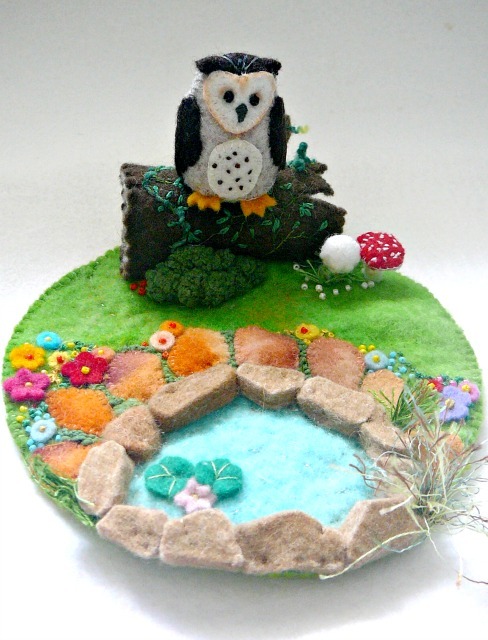 There is a slight difference, as this time the little owl that is sitting on the hollow log is hand is stitched rather than needle felted. The owl resulted as a happy accident, rather than intention, as a result of finding felt scraps that wanted to be an owl. This small mat lends itself to story telling as well as being suitable for gentle play and as an accessory for the nature table. As in most of my other scapes, water is a feature. In ancient times water was regarded as a sacred and precious gift, the lifeblood that flowed from the womb of The Great Goddess, The Mater or Mother, creating and sustaining life. The right of all living things to clear air, clean water and pure food seems to be more and more disregarded. Waterways are used to dump toxic waste and human waste, as well as being contaminated with chemicals from industry, mining, fracking and agriculture. Privatisation seems to regard water, that essential component for life, as a commodity to trade, to control, to withold and to abuse. Samuel Taylor Coleridge remarked, in his poem “The Ancient Mariner, “water,water everywhere and not a drop to drink”, sadly this is becoming the reality of our world. This scene has another layer of meaning. The owl as symbol of the Goddess , of wisdom and of seeking for the core truth that is held within, sits still, gazing at a small pool that could even be an ancient healing well or spring. Working on this piece made me think deeply about these issues, reflecting, and wishing that all mankind realises we need to work together, care deeply for each other and for Mother Earth. Thankyou. it has been a bit of a crazy time and i have been tardy. but that you stoped by and took time to contact me is much appreciated.